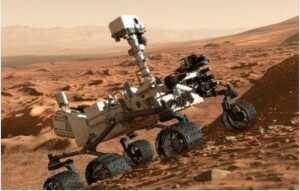 A little more than 24 hours before this week’s show, the Curiosity Rover was deposited on the surface of Mars. Seeing the excitement and inspiration this event inspired in so many people, I thought it would be fun to make a show out of it, so this week’s playlist starts with Mars-oriented music and spreads more widely into a space theme. It was pretty easy to fill a whole show, although we took one side track to play a tune for my friend and former fellow-DJ Jonas, who dropped by to see the current WNUR studios, which opened after his tenure on the air.